The styles you wear don't just express your personal taste, they convey a mood too. Philips' SKIN Probes use biometric sensors and lighting to pick up on your feelings and make them visible. 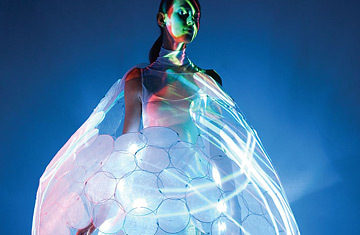 The Bubelle dress (above) changes color depending on your mood. The Frisson bodysuit is covered with LEDs and fine copper hairs that light up when brushed or blown on.